Persian Date and Time v2.00 freeware for Windows Mobile Phone. Summary: This program is Gregorian, Persian, and Hijri calendar and date convertor with a today screen item. 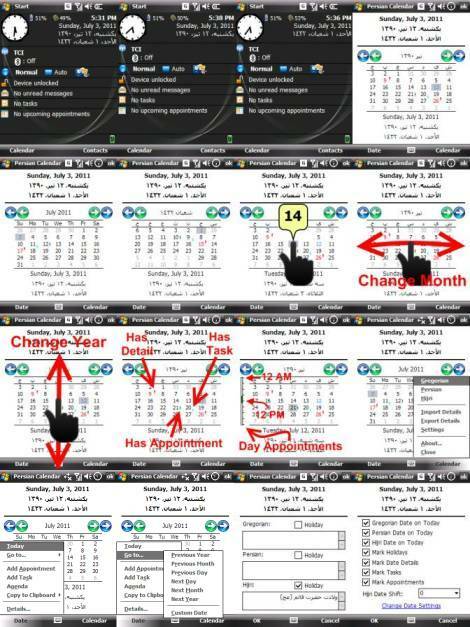 This program is Gregorian, Persian, and Hijri calendar and date convertor with a today screen item. - navigate calendar by dragging your finger on it. - add tasks and appointments. - add details to a certain day and mark it as holiday. If the download link is broken use mirror download. hi, i can not download it. I cant dowmload it. why? i can not operate soft ware. i dont see this i list of today's items and i can not choose. does anyone help me in this issue ? Sorry, I haven't chinese calendar. Do you have Chinese calendar as well? Thanks!